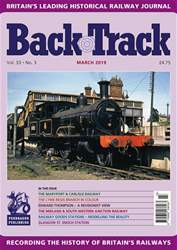 The Trials and Triumphs of the Midland & South Western Junction Railway - the distinctive Joint Line between Cheltenham and Andover recalled by Jeremy Clarke. 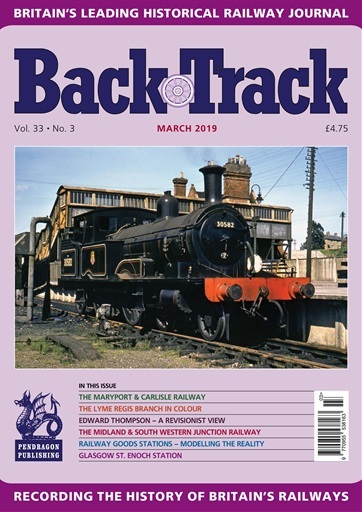 The Marples Report: Part Two - Mark Tittley concludes his consideration of the role of Transport Minister Ernest Marples in the Beeching Report and its consequences. Placating the Civils: Part Three - Miles Macnair presents his conclusions. A Perfect Specimen - Jeffrey Wells charts the rise of the Maryport & Carlisle Railway 1836-1890. Glasgow St. Enoch station - archive photos of a lost Glasgow terminus. Dorset Delight - four pages of colour on the Lyme Regis branch. A Revisionist View of Edward Thompson: Part One - L. A. Summers considers the career of an LNER Chief Mechanical Engineer who hasn't always received the most favourable of judgements. When Roads and Rails Meet - colour spread by Paul Aitken. Kemble Station and its Branches: Part Two - Mike Fenton concludes his review of the Railbus Years at this Gloucestershire country junction. Timber Structures of the Lancashire & Yorkshire Railway - some historic photos presented and described by Jeffrey Wells. The Ashton Valve Company - From the USA Rick Ashton brings the story of a locomotive manufacturing company which had its origins in England. Railway Goods Stations: Modelling the Reality - Bob Essery takes an unusual approach to describing the workings of a typical town goods depot with the aid of a classic model display.